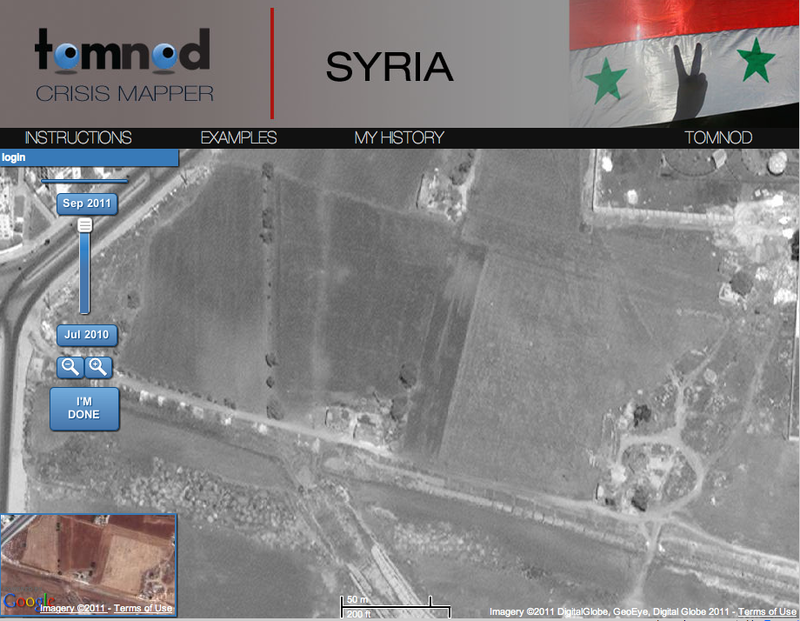 Members of the the Standby Volunteer Task Force (SBTF) Satellite Team are currently tagging the location of hundreds of Syrian tanks and other heavy mili-tary equipment on the Tomnod micro-tasking platform using very recent high-resolution satellite imagery provided by Digital Globe. We’re focusing our efforts on the following three key cities in Syria as per the request of Amnesty International USA’s (AI-USA) Science for Human Rights Program. To recap, the purpose of this experimental pilot project is to determine whether satellite imagery analysis can be crowdsourced and triangulated to provide data that might help AI-USA corroborate numerous reports of human rights abuses they have been collecting from a multitude of other sources over the past few months. The point is to use the satellite tagging in combination with other data, not in isolation. To this end, I’ve recommended that we take it one step further. 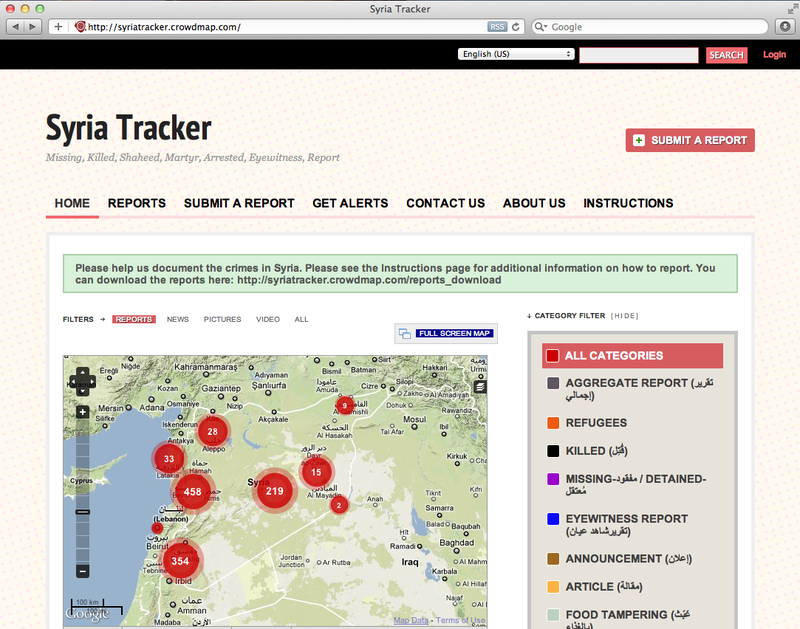 The Syria Tracker Crowdmap has been operations for months. Why not launch an Ushahidiplatform that combines the triangulated features from the crowdsourced satellite imagery analysis with crowdsourced crisis reports from multiple sources? The satellite imagery analyzed by the SBTF was taken in early September. We could grab the August and September crisis data from Syria Tracker and turn the satellite imagery analysis data into layers. For example, the “Military tag” which includes large military equipment like tanks and artillery could be uploaded to Ushahidi as a KML file. This would allow AI-USA and others to cross-reference their own reports, with those on Syria Tracker and then also place that analysis into context vis-a-vis the location of military equipment, large crowds and check-points over the same time period. The advantage of adding these layers to an Ushahidi platform is that they could be updated and compared over time. For example, we could compare the location of Syrian tanks versus on-the-ground reports of shelling for the month of August, September, October, etc. Perhaps we could even track the repositioning of some military equipment if we repeated this crowdsourcing initiative more frequently. Incidentally, President Eisenhower proposed this idea to the UN during the Cold War, see here. In any case, this initiative is still very much experimental and there’s lots to learn. The SBTF Tech Team headed by Nigel McNie is looking to make the above integration happen, which I’m super excited about. I’d love to see closer integration with satellite imagery analysis data in future Ushahidi deployments that crowdsource crisis reporting from the field. Incidentally, we could scale this feature tagging approach to include hundreds if not thousands of volunteers. In other news, my SBTF colleague Shadrock Roberts and I had a very positive conference call with UNHCR this week. The SBTF will be partnering with HCR on an official project to tag the location of informal shelters in the Afgooye corridor in the near future. Unlike our trial run from several weeks ago, we will have a far more developed and detailed rule-set & feature-key thanks to some very useful information that our colleagues at HCR have just shared with us. We’ll be adding the triangulated features from the imagery analysis to a dedicated UNHCR Ushahidi platform. We hope to run this project in October and possibly again in January so HCR can do some simple change detection using Ushahidi. In parallel, we’re hoping to partner with the Joint Research Center (JRC), which has developed automated methods for shelter detection. Comparing crowdsourced feature tagging with an automated approach would provide yet more information to UNHCR to corroborate their assessments. This entry was posted in Crisis Mapping, Crowdsourcing, Satellite Imagery and tagged AI-USA, Human, MechanicalTurk, microtasking, Rights, Syria, Tomnod. Bookmark the permalink. What an incredible project. There’s a lot of promise in the way you’re using technology here. Let me come right out and say I am very impressed by Ushahidi and your innovative development of crowdsourcing tools. I am writing because I disagree with some of your articles’ assumptions about the value in tracking Syrian military equipment as either a predictor, or record, of human rights abuses. The problem is that while the fidelity of your satellite imagery may be sufficient to identify static refugee structures (such as in your previouse projects), it is marginal at tracking military equipment and identifying “who’s who” in a crowd. The presence of massed military equipment provides circumstantial confirmation of the presence of troops — then again, it may be meaningless because Syria has to put its military equipment somewhere. A lot of crowd power could be spent on this with little return. May I suggest that a better way to get more juice from the squeeze is to focus on imagery indicators which confirm ground reporting. If there is a report of military equipment shelling/bombing a town, can you get some “before and after” shots which confirm that (walls knocked down, craters, houses flattened or burned)? Can you get photos of cars stacked up on a road to indicate movement restrictions in a population (or mass exodouse)? Can you get pics of Syrian airfields which confirm that Syrian aircraft were indeed not at their bases during times which corresponds to arial attacks. These are affirmative correlators. This is all just IMHO. Thanks Jeremy, your recommendation is exactly what we plan to do. Keep in mind that the use of satellite imagery for human rights monitoring is not new. AAAS and AI-USA have been doing this for years. I’m checking the site links out now. Exciting potential… Enjoy the outrageously expensive restaurants in Doha. If I remember correctly, there is a great seafood restaurant on Al Corniche…caught and served w/in minutes. Patrick Meier, thanks for stealing this idea from my head. I thought about this project couple of days ago. I even started talking to Digital globe about it! And tonight when I was doing my homework searching for other resources similar to my genius idea here you are with this link. Well at least I learned new word today “Crowdsourcing”. Is there any way I can help? Please let me know. I’m originally from Damascus-Syria and I would love to participate in your project to help my fellow Syrians achieve their freedom soon.